ONE way to take Berlin is to wonder at the stupendous mess caused by the renewal effort. Another is to lose oneself in the new architecture, which is surprisingly unpretentious but a bit cold and conformist. Yet another is to keep one's distance, as Germans from the West tend to do; they seem terrified by the mystique of the place and the fact that it is so much bigger and more threatening than the German cities they know. One can try picking out East Berliners from West Berliners, which used to be easy but now requires flair and a knowledge of hairdos and street posture. Or one can grow impatient for the new Berlin to be finished and show itself in its true colors. The hard thing is to remain aware of what is being smoothed away. Heiner Müller, eulogized as Germany's best postwar playwright when he died, just over a year ago, had given himself a mission: "German history is my enemy," he used to say, "and I want to stare into the white of its eye." Berlin was Müller's home, and the city is covering its tracks so fast that it has resorted to painting a red line through its heart to show baffled visitors where the Wall used to run. One simply can't see where it was anymore, let alone make out the moral silhouette of this painful century. This is a strange time in the life of Berlin -- the hiatus between its redesignation as Germany's capital and 1999, when it will begin acting the part. Each day one finds oneself losing touch a little more with what went on before. The experience is not entirely welcome -- though, heaven knows, it ought to be, given what did go on. There was something truly weird about the old East Berlin in particular, something so awful that the place possessed a certain appeal. Now the bombed sites and vacant lots that told of Hitler's madness and pocked central Berlin for half a century are as good as gone. Even the shoddy Communist building style, which more than anything else revealed the soul of the Deutsche Demokratische Republik (DDR), is slipping into anonymity, as modern construction sweeps through Berlin's old center in the eastern sector. The top names in international architecture -- the superstars here are Americans, British, French, Italians -- and the developers who employ them are, well, ruining the view. Those who hanker after an "old Berlin" have not exactly given up. Indeed, they seem to be on a roll. Architectural traditionalists who favor cornices and a dose of old-time Prussian arrogance were laughed at when it came to planning a new Berlin after the Wall fell, in 1989. The style that city planners chose was relentlessly classical-modern, which meant filling the void at Berlin's heart with flat stone-and-glass façades of restricted height (100 feet). But now there are second thoughts. The conservative Christian Democrats who head the reunified capital's coalition government have detected a welling up of discontent among Berlin's put-upon populace. Isn't the current approach too rigorous? Where is the warmth? The character? The upshot is that the city government's longtime building director, a man of Prussian rigor who rejected frills, has been replaced by a warmer-hearted soul from Germany's far-western and far softer Rheinland, who says that she has in mind "a little fantasy, some poetry." So traditionalists believe that they are back in the fray, particularly on a crucial mile of Unter den Linden heading east from the Brandenburg Gate. Maybe. But the classical-modernists are streets ahead of them, being able to build faster (an advantage that appeals to investors and developers). In any case, the traditionalists wish not so much to hold on to genuine history as to replicate it. The base camp for their comeback is a near copy of the once-renowned Adlon Hotel at its old site by the Brandenburg Gate. The Adlon replica revives a hotel that was so plush a place to stay when it opened, in 1907, that Kaiser Wilhelm stopped anyone from checking in until he had tried out its pomp for himself. Many Germans want to re-create the imperial castle of the Hohenzollerns (the Prussian dynasty) right where it used to stand, between two arms of the river Spree at the other end of Unter den Linden. Think what one will of this scheme, it has the support of Germany's most powerful citizen, Chancellor Helmut Kohl, and, it seems, of the Christian Democratic mayor of Berlin, Eberhard Diepgen. Most Germans assume that Allied bombs destroyed the royal castle, but in truth the first Communist masters of the DDR inherited it in eminently restorable shape and demolished it in 1950 out of anti-imperial spite. Diepgen would love to remove the crass Palace of the Republic that the Communists built in place of the castle for use by their rubber-stamp parliament. This is a touchy matter, though. 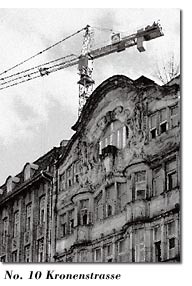 The orange-toned DDR edifice somehow became the pride of ordinary East Germans, and it will hurt the feelings of a lot of Diepgen's new supporters in the eastern part of the city to bring it down, especially for the purpose he now has in mind. I wonder, anyway, whether Heiner Müller, were he still around, would bother to stare at an imperial Prussian mock-up. MORE likely Müller's eyes would be glued on Kronenstrasse. These days there are precious few streets like Kronenstrasse left in the Mitte (central) district, Berlin's old heart. Even among the half dozen that for some reason or other have not been overwhelmed by the construction wave, this street is special: it is a class apart in drabness. Right next to Checkpoint Charlie, the Cold War's east-west crossing point, Kronenstrasse reeks of the Berlin that people of my postwar generation always imagined. Irish and Polish hardhats have almost finished building a showy American business center at Checkpoint Charlie, yet somehow one can still hear the stomp of East German border guards there and the rustling trenchcoats of CIA and KGB agents whose offices overlooked the crossing point from opposite sides of the wall. The street's bottom-dog eccentricity is only accentuated by Friedrichstrasse, which it crosses. From Prussian imperial times to the Third Reich, Friedrichstrasse was Berlin's equivalent of New York's Fifth Avenue, and it has already returned as a shining token of the new Berlin's commercial purpose. Friedrichstrasse is for now short of well-heeled shoppers, but more deutschmarks are said to have been sunk into its renaissance than have been invested by German business in all Eastern Europe since communism's fall. Next to it Kronenstrasse is a disinherited mess. Kronenstrasse hangs on the verge of new things, but after all the roles it has played in this century -- the name, "Crown Street," was meant to honor its Prussian past -- it seems unsure whether it wants to play another. While strolling recently on Kronenstrasse I came across Liselotte Irmler in Pfefferkorn's, an electrician's shop that, exceptionally, came through the DDR era under private ownership. The shop is like a Victorian cupboard jammed with coils and bulbs; maybe the DDR decided it was unworthy of a state takeover. I had been looking for someone like Frau Irmler. She arrived on Kronenstrasse in 1941, after marrying the Irmler boy who ran the family store. Later, under the Communist regime, when she remarried, her son took it over, renaming it Pfefferkorn's after her new husband. She is a chirpy little woman in a gray coat -- a real DDR veteran. I wanted to know what the street had been like before. Frau Irmler had no hesitation. "The best I ever knew it was when I first got here. In the early 1940s we had smart people coming and going, people with class. You didn't even feel the war then." I tried to picture what sort of people she meant. It was true, Hitler's war had been well under way. In those days, she reminded me, Kronenstrasse ran between Berlin's garment district, now vanished, and the heart of the Nazi Reich. Goebbels's Ministry of Propaganda had stood not a hundred yards from where we talked. The place had surely swelled with Nazi might. Just past a church at the end of the block and an expensive hotel had been, Frau Irmler noted, Hitler's chancellery. "All that's gone now, everything," she said with a shrug. From the time the Wall went up, there was silence: "Never a sound, except when something was going on at Checkpoint Charlie." 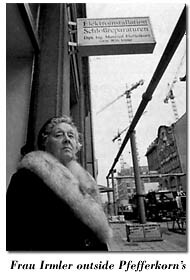 The East Berlin tram and subway, she said, would halt and turn around before reaching her part of the street. I have grown curious about this block, which is the very start of Kronenstrasse. A year ago, when I began watching it, the south side of the block, across from Pfefferkorn's, had a bombed-out vacant lot at one end and a forlorn Berlin Casino, a bizarre entertainment fling by the DDR's grand vizier, Erich Honecker, at the other. (The casino was not quite ready to open when the Wall fell, and so it never did.) In between were three dilapidated buildings surviving from the 1890s -- two of them handsomely baroque and all but abandoned -- and a long, low barracks-style shack, also abandoned, which had served as a dormitory for DDR hardhats. There were reasons for the block's eerie air of abandonment. The DDR had all along declined to fill in gaps created by wartime bombing or even to repair much of the shell damage left by the hectic passage of the victorious Red Army in 1945; it preferred to house its citizens anew in suburban concrete deserts far from the Wall. The last thing it wanted, once it built the Wall, was to have people hanging around interfering with border guards. Changes I noticed while spying on the block needed decoding. A pirate used-car dealership festooned with the usual silvery tinsel, meant to dazzle hard-up East Berliners, suddenly disappeared from a bombed site behind the casino. Then a bulldozer came by one day before sunup to flatten the workers' dormitory. Something was afoot. Soon I noticed a sharp reduction in lights burning at No. 3 -- the one place with a spark of life, a tempestuous building that, Frau Irmler says, used to cater to chauffeur-driven DDR generals responsible for guarding the Wall and shooting people who tried to cross it. The barbershop at street level has loyally retained the old looped DDR lettering on its FRISEUR sign, though this is now interlaced with slow-blinking lights announcing the establishment's current role as a late-night hideaway for reunited Berlin's "techno-music" freaks. I'm expecting all those lights to go out in another blink. The need to decode is already past: by last summer redevelopers had reduced Honecker's unopened casino to rubble, and No. 3 could be next. Indeed, the wonder of Kronenstrasse is that post-unification property developers left such a central site alone for so long. SHORTLY before bulldozers ran amok at the casino, I went to see a judge at Berlin's central administrative court to find out why this tacky oasis survived. She was young and, though not deliberately evasive, seemed bound by rules of secrecy in the matter. It turns out that since unification this block of Kronenstrasse has been a battleground of claims from former owners (more than 200,000 separate claims have been made on property in the Mitte district alone). The judge declined to say more except that residents of Kronenstrasse, with its commercial location and proximity to the garment district, had been predominantly Jewish until the 1930s. Despite her reticence she was revealing about Berlin. Her toenails, I could not help noting, were painted green (sultry weather had put the whole town in sandals). She, too, seemed to be part of the Berlin that risked being smoothed out. My bet was that there would be nothing so alternative peeping from beneath the robes of her successor. Also, she delivered a final judgment that proved to be unerring: I needed to go, she said, to the Stasi. The old East German secret police are (more or less) out of business now, but the judge directed me to a place that had been one of their administrative centers, in Berlin's charmless eastern suburbs. Under its corrugated tin roof the present city authorities were temporarily storing property records relating to the Mitte district. Instead of opening citizens' private mail and tapping their phones, the center's personnel had turned to digging out dusty deeds for lawyers to poke through. A former Stasi secretary -- a stout woman in a sky-blue T-shirt with the sequined motif MADISON AVENUE glittering on her bosom -- pulled out the files on Nos. 1-14 Kronenstrasse at my request. That took in the entire south side of the block. It is hard to imagine the block as those deeds show it to have been. From the 1890s to the early 1930s it was a thriving concourse of merchants and lawyers. Its glovemakers and furriers advertised retail outlets in London, Amsterdam, and Vienna. On the corner that became Erich Honecker's casino-that-never-was stood a smart food house named Aschinger's. From the turn of the century the Fleischmanns owned an apparel factory at No. 10, the Reichsteins a trading house at No. 11. I imagined those swirling Berlin street scenes painted by Ernst Kirchner and the German Expressionists, with black-coated gents in tall black hats and women with feathered hats and tapering noses. Starting in 1936 the Nazi authorities dispossessed the owners of most of the buildings on the block. Swastikas ran across the deeds, with the stamp "EINGANG!" (to signify that the Nazis had broken into the building and would brook no dispute) followed by "Property of the German Reich." No. 6 became a Nazi police office; other buildings were sold at auction to banks. No. 10 passed into the hands of I. G. Farben, the chemicals giant that produced poison gas for the extermination camp at Auschwitz. Then the Russians took over. From war's end until 1949 the Soviet sector confiscated property at four of the fourteen addresses, whether they were in ruins or not, in particular under what it called List-1 regulations, which were directed against war criminals and Nazism's mentors. In 1943 the brewery Schultheiss, today headquartered in Dortmund, had bought the bombed ruins of Aschinger's at No. 14, only to be dispossessed under List-1 -- as was I.G. Farben, four doors away. The former chemicals giant, incidentally, refuses to die. It has been in liquidation for decades, in part to enable it to pay compensation to people it used for slave labor, but its officials, encouraged by shareholders, still seek to retrieve a host of properties in the former East Germany -- No. 10 Kronenstrasse included. A series of court rulings have denied I. G. Farben's claims, but the skeleton company bearing its name lives in hope. At two other addresses on the block the Russians, striking out at the capitalist foe, expropriated property that had passed during Hitler's time into the hands of German banks and insurance companies. Soon after the DDR came into being, in 1949, the Russian solution was generalized. From about 1951 onward, culminating in 1961, when the Wall went up, deeds of ownership on the entire block bore the definitive DDR stamp: "EIGENTUM DES VOLKES" ("Property of the People"). So there was nothing to prevent Erich Honecker from indulging his fancy for a casino. By that time, the mid-1980s, he had come around to encouraging construction in the hitherto forbidden vicinity of the Wall. His regime, unaware that its end was nigh, conceived it as a "house of entertainment." The man Honecker groomed to succeed him, Egon Krenz, disowns the demolished attraction. "I can't tell you anything about it," he groused in response to my telephone inquiry. "I have no interest in casinos. Where is it?" Well, Krenz has other things on his mind. He is still seeking to block his endless trial with other DDR bosses on charges related to the killing of more than 600 Easterners who attempted to escape across the fences that his regime erected. But the casino was real, all right. Its purpose was to impress foreign diplomats and well-heeled Westerners who came through Checkpoint Charlie, and then to milk them for the hard currency the DDR always needed. Christian Schmidt, who was the casino's construction manager, retains a certain respect for the building. Though largely made of the square prefabricated concrete slabs that typify DDR construction, it had a shining glass façade and some unlikely decor inside. "It was an honor to build, after the Sputnik housing estates I did out in the suburbs," Schmidt says. Gracing its interior were Indian marble, crystal mirrors, and stone mosaics -- materials that DDR builders seldom got to use. Finishing touches were still lacking when both the nearby Wall and Erich Honecker fell, but the casino was nonetheless completed. Schmidt says he resumed work when the deutschmark came east, six months later: "I had a job to finish and I wanted to get paid for it." He was paid -- in deutschmarks -- through the public agency that the Bonn government set up to sell off firms and property in the East. Schmidt may be the only person to have cashed in chips at the casino -- though I hoped, after hearing his account of the interior, that the Polish hardhats who demolished it at least made off with some of the Indian marble. THE Bonn government's sell-off agency has finished Kronenstrasse. The side of the block I spied on is almost entirely in the hands of two large German investors: an insurance group and a property developer. They acquired the block partly through the sell-off agency but mainly from pre-war private owners who regained title to their property and then sold it. The owners' heirs don't seem to want to come back and live here; they prefer America, long their home. The new corporate owners are faceless, and their looming invisibility creates a certain tension. Kronenstrasse gulps before the unknown. Its only survivors who can count on participating in what lies in store are the baroque characters at Nos. 10 and 11, respectively the building that I. G. Farben haunts and its rococo neighbor, which seems to have become a sort of post office. (The last piece of correspondence I saw pinned to its door said, in English, "Hi, Eddy. Report at once. Very important. Come by at all costs. Otherwise.") Berlin has placed this pair of buildings on its monument protection list -- the sole guarantee against demolition in a city where promoters have the upper hand. There is no law requiring developers to keep intact anything that does not appear on the list, and the list itself stops well short of including all pre-war architecture or even turn-of-the-century architecture. The quirky FRISEUR at No. 3 is still in peril. Kronenstrasse, then, will be sharpening up for the return to Berlin of the German government. The developers' plans call for a huge new office building in black glass enveloping the casino end of the block, incorporating Nos. 10 and 11, and an even larger diplomatic center covering the rest of what used to be Nos. 1-14. The idea behind the diplomatic compound is to provide embassy quarters for countries not large or rich enough to have separate embassies. So Frau Irmler may soon get to hobnob with the fancy dressers again. With envoys from the South Seas and Ruritania. People with class. It looks like a glamorous revival for the block. But not much for the likes of Heiner Müller to stare at.